Last night I went to see Foxcatcher with Danny. 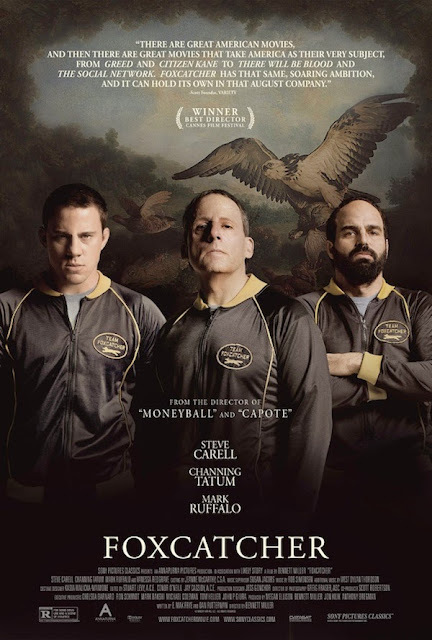 It stars Steve Carrell, Mark Ruffalo and Channing Tatum, and is about team Foxcatcher and head coach John Du Pont, who hires two brothers to help him reach Olympic gold in wrestling. The trailer for this movie was tense and exciting, and while at moments it was that, it was a lot slower and less thrilling than people might have wanted. I enjoyed it but probably wouldn't watch again, and it's probably not something most people would. I really liked the acting in this movie. Steve Carrell is barely recognisable in this role and his make up and acting style is wonderful. I'm really proud of him for getting nominated for best actor. Mark Ruffalo was the best by far, his acting was spot on and really believable as this big brother and coach role. Channing Tatum was also really good especially in one scene where he repeatedly hits himself. For me Mark Ruffalo stole it though and if he gets best supporting actor, I'd be happy. I did enjoy this film and would reccomend it if you like actors acting well and an interesting storyline, but it's not one for everyone.